The doctoral program in situ microscopy with electrons, X-rays and scanning probe techniques combines these three pillars of nanocharacterization into a structured Research Training Group for the first time. The main objective of this program is to provide the next generation of scientists and engineers with comprehensive, method-spanning and interdisciplinary training in the application of cutting-edge nano-characterization tools for materials and device development. Within the program, in situ methods will be further developed and used to explore fundamental processes regarding the growth, stability and functionality of complex nanostructures and interfaces. 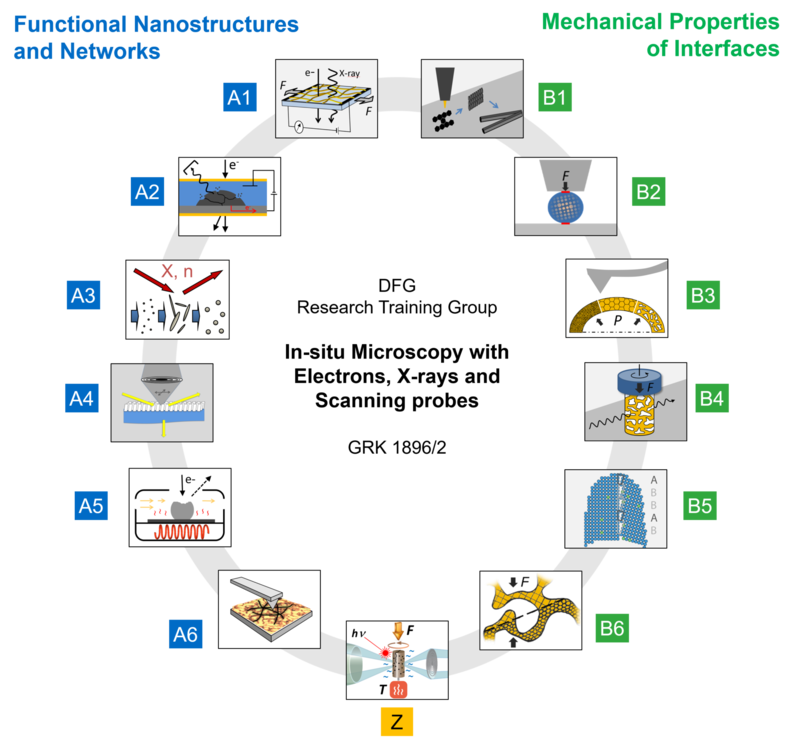 Project area A: Functional Nanostructures and Networks will address the properties of individual nano-objects and how these translate into functional systems when assembled to nano-networks. In Project area B: Mechanical Properties of Interfaces with different bonding characteristics and morphologies which gained interest due to their profound role for functional materials systems will be studied in well-defined loading scenarios. The PhD candidates focus on the integration of their independent studies onto international collaborations and are trained in combining complementary techniques to accelerate their scientific research.